At this time of year we often find ourselves with an abundance of some things, and a deficiency of others. Unfortunately, the abundant things are not always the most appealing: in my case, thanks to my weekly vegetable box delivery, I have an excess of root vegetables - specifically celeriac and turnips - and a deficit of money. For occasions like this, it's incredibly important to have a stash of handy recipes that can turn the unenviable abundance of root vegetables into a show-stopping meal. 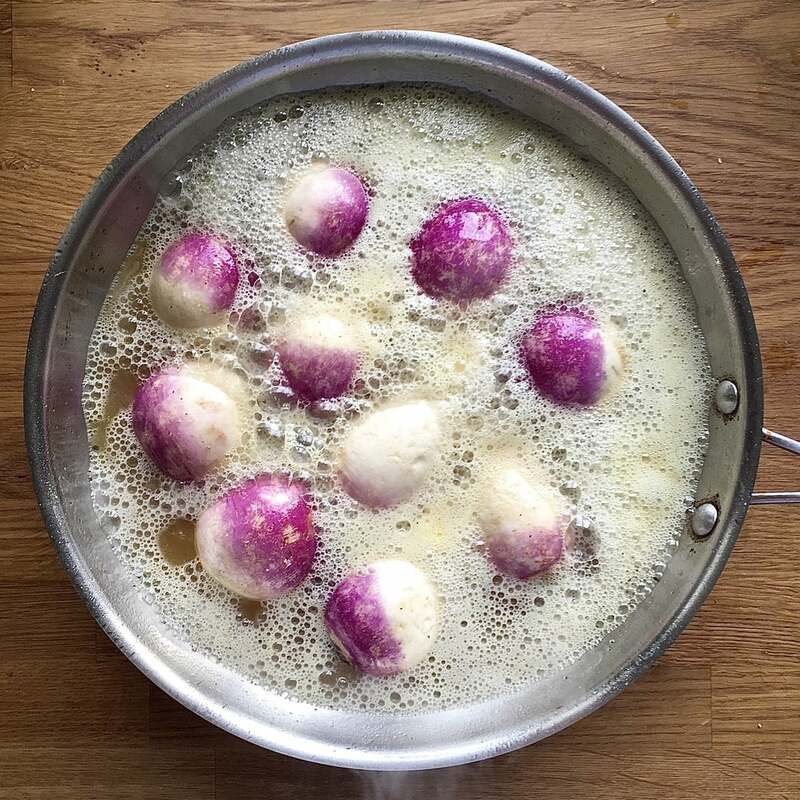 In this recipe, by effectively making a confit of turnips with cider and maple syrup, we are turning a vegetable often seen as no better than animal feed into a vegetable dish worthy of a starring role. It is, in fact, one of the most addictive ways with vegetables I have ever come across. Preheat your oven to 200C/400F/gas 6. Place an ovenproof saucepan over a medium-high heat and when hot, add your olive oil. Add the turnips, cut-side down, and sprinkle with salt and pepper. Cook, without moving, for 4- 5 minutes until lightly browned. Add the butter, maple syrup, cider and sage to the pan and cook for a further 2 - 3 minutes. 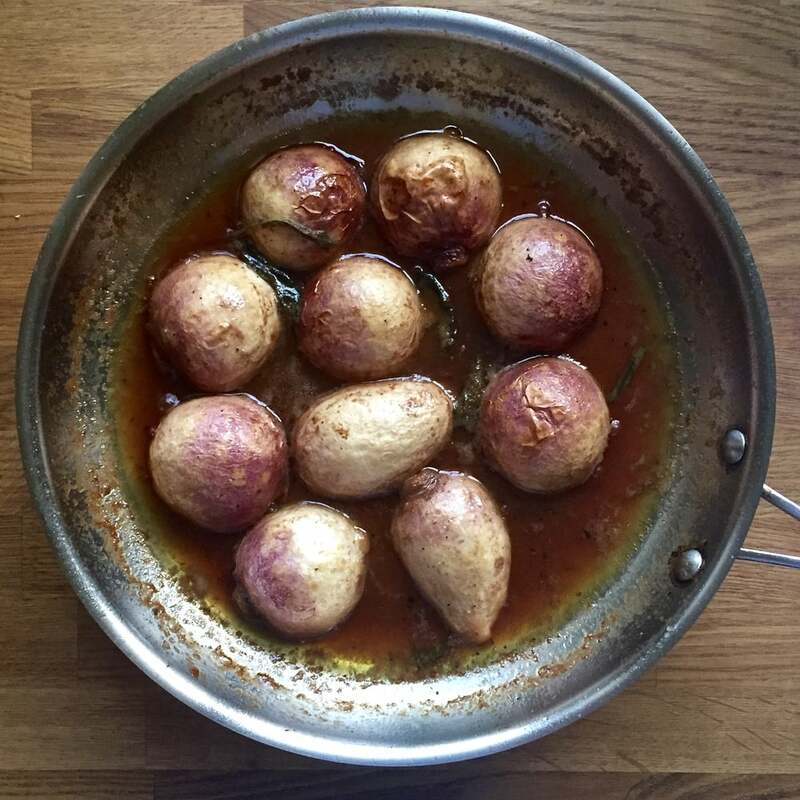 Place the pan in the oven and leave to cook for 45-50 minutes until the cider and maple syrup have disappeared and you're left with a unctuous glaze around the turnips. Remove the pan from the oven and, off the heat, add your turnip tops to the hot pan. Gently fold the turnip tops though the turnips and the cooking liquor until the tops are wilted and everything is a tangle in the pan. Check the seasoning, perhaps adding a crunch more black pepper, and serve. This is delicious served on top of buttered toasted bread, or equally as a side with a pork chop or a piece of white fish.